Get your heart racing at the Tsogo Sprint. 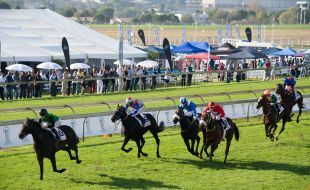 One of South Africa’s longest running and best horse racing events. One of six main races in SA, and the country’s only sprint event that consists of four Grade 1 races in one day. Grade 1 races is that these races have the top quality/ most elite horses from all around South Africa who participate in the races. It is the “Olympics” of sprint horse racing. Pietermaritzburg’s biggest, oldest and richest sprint event. Tsogo Sun has sponsored the Golden Horse Sprint (now known as Tsogo Sun Sprint) for 14 years. Golden Horse Casino is the only casino in Africa and one of only two in the world to be located on a racecourse. For More information on the Tsogo Sun Sprint 2016 event visit our blog.